We are MC Publishing Limited, a small, local independent publishing company that have been producing The Bath Magazine for over 13 years. We are passionate about producing the highest quality content and on a mission to impress, seduce, and satisfy our readers with our discerning, sometimes quirky, always engaging and much loved publishing style. The Bath Magazine reaches more ABC1 readers than any other monthly magazine in the city, every month 20,000 high quality glossy copies are distributed to homes and businesses across the city. Our main aim is to keep readers informed of all the good things going on in the city, previewing events across a diverse cultural mix, from comedy and children’s events to art and high drama, and reporting on the city’s myriad of festivals. Every month our upbeat, intelligent writing covers a variety of interests including books, interiors, gardening, travel, health and beauty, fashion and style, food and drink and walks. We also have the biggest, glossiest selection of homes for sale of any publication in the area. We’re an independent publication too, since our launch in 2002 we have built up a loyal following and are widely regarded as the city’s finest place for advertisers to reach a highly targeted and attractive audience. 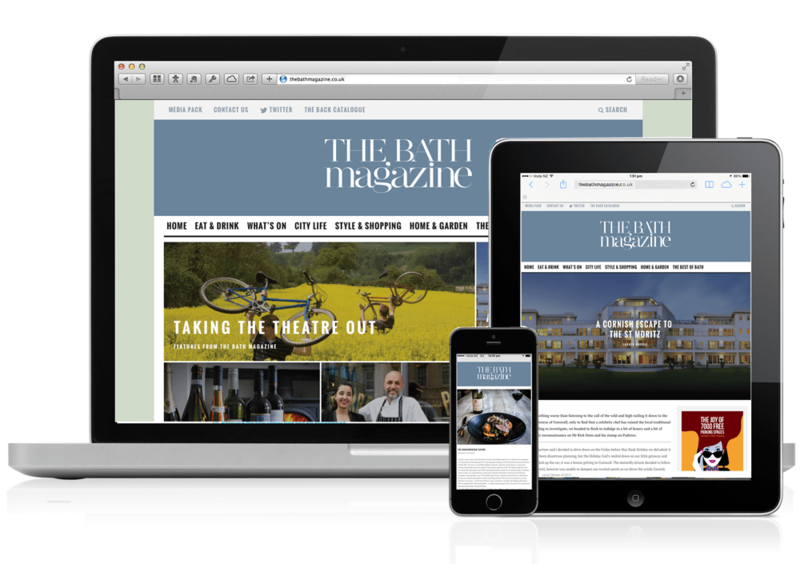 www.thebathmagazine.co.uk is the city’s discerning online hub, delivering everything good that’s going on in our city all in one place. As well as giving you all The Bath Magazine’s regular monthly features, thebathmagazine.co.uk is capable of delivering up-to-date, must-know information on a daily basis. The great thing is, that because of our broad knowledge of our city, and a vast and well established network of clients and contacts – all providing us with a pick of the best information and goings on –our growing social and online audience can access engaging, savvy content at any time, wherever they are. And, for those who live outside our delivery areas, or do not get to pick up The Bath Magazine,then there’s even an online ‘flippable’ edition they can flick through. Our social media account on Twitter has reached over 10,000 followers, to join in with all the latest news, articles, exclusive events and much more click here to follow. Advertising in The Bath Magazine is one of the most engaging promotions that can be done in Bath. Add to that some advertising or listing on this website, and Social Push notifications you will then have complete access to all our readers and followers. It’s big and very effective.